Golden Harvest brings more choices to farmers, expands soybean portfolio with new trait technology. MINNEAPOLIS, USA, April 15, 2019 – Golden Harvest demonstrates its continued dedication to the local needs of farmers by expanding its soybean portfolio with the latest trait technology. By adding the new Enlist E3™ to its current portfolio – which already includes Genuity® Roundup Ready 2 Yield®, Roundup Ready 2 Xtend® and Liberty Link® soybeans – Golden Harvest offers farmers access to more trait choices than almost any other seed company. In addition, the company is evaluating the LibertyLink GT27™ trait to offer even more choice. Golden Harvest will have trials of Enlist E3 soybeans for the 2019 growing season, with broad commercial availability for 2020 planting. Enlist E3 soybeans offer advanced herbicide tolerance through three modes of action with tolerance to 2, 4-D choline, glyphosate and glufosinate. Having received Chinese import approval in January, the Enlist E3 trait technology will be available for 2020 planting in 30 Golden Harvest® soybean varieties. The Golden Harvest portfolio is available from Golden Harvest Seed Advisors, who combine high-yielding seed options with tailored field recommendations based on their local agronomic knowledge. To find your local, independent Seed Advisor and learn more about Golden Harvest hybrids and varieties, visit GoldenHarvestSeeds.com. 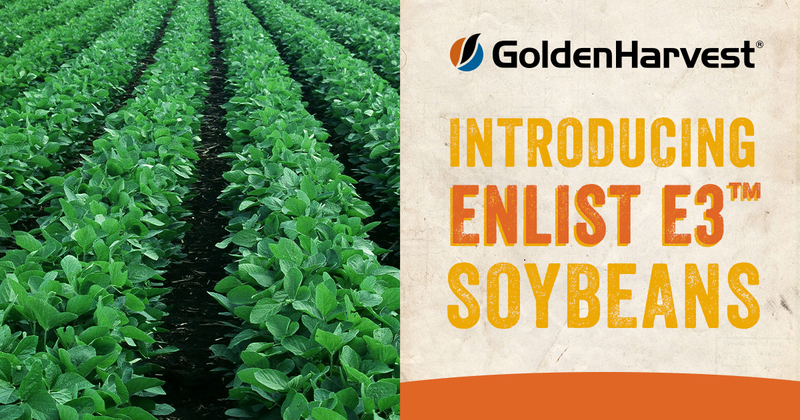 Continuing its dedication to local farmers’ needs, Golden Harvest is excited to offer more choice by adding the new Enlist E3 trait package to its soybean portfolio. ©2019 Syngenta. Important: Always read and follow label and bag tag instructions; only those labeled as tolerant to glufosinate may be sprayed with glufosinate ammonium based herbicides. LibertyLink GT27™, LibertyLink®, Liberty® and the Water Droplet logo are registered trademarks of Bayer. Enlist E3™, HERCULEX® and the HERCULEX Shield are trademarks of Dow AgroSciences, LLC. HERCULEX Insect Protection technology by Dow AgroSciences. Under federal and local laws, only dicamba-containing herbicides registered for use on dicamba-tolerant varieties may be applied. See product labels for details and tank mix partners. Golden Harvest® and NK® Soybean varieties are protected under granted or pending U.S. variety patents and other intellectual property rights, regardless of the trait(s) within the seed. The Genuity® Roundup Ready 2 Yield® and Roundup Ready 2 Xtend® traits may be protected under numerous United States patents. It is unlawful to save soybeans containing these traits for planting or transfer to others for use as a planting seed. Roundup Ready 2 Yield®, Roundup Ready 2 Xtend®, Genuity®, Genuity and Design and Genuity Icons are trademarks used under license from Monsanto Technology LLC. Other trademarks displayed or otherwise used herein are the property of a Syngenta Group Company or the respective trademark owners.